Put the rice into a sieve and rinse under cold running water; drain. Combine the rice and water in a heavy based saucepan. Cover and bring to the boil, then reduce the heat to low and simmer, covered, for 15 minutes. Remove from the heat and stand, still covered, for 10 minutes. Heat the canola oil in a deep frying pan or wok, and cook the onion and mushrooms over medium heat for 5 minutes, until soft and lightly golden. Add the chicken and cook for 2 minutes. Add the soy sauce, vinegar and sugar, stir to combine, then add the dashi stock. Bring to a simmer. Pour the eggs over the mixture, cover (use a baking tray if you don’t have a lid) and cook for about 2 minutes, until just lightly set. To serve, divide the rice into deep bowls. Spoon the chicken and egg mixture, with the broth. Top with snow peas and green onions, and serve immediately. 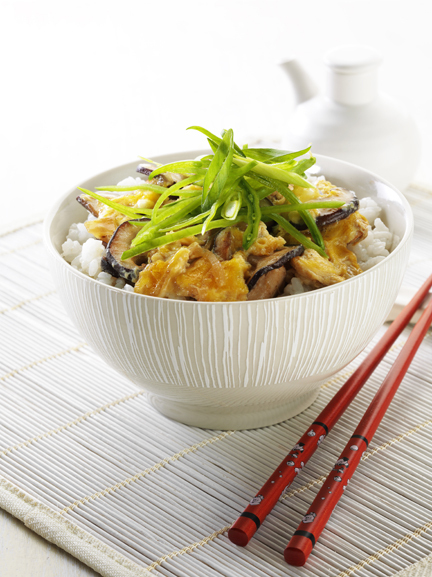 Tip: Sushi rice, dashi and rice vinegar are available at most large supermarkets. Make up dashi stock by combining a 10g sachet with 1 cup boiling water. You could use chicken stock if dashi is unavailable.